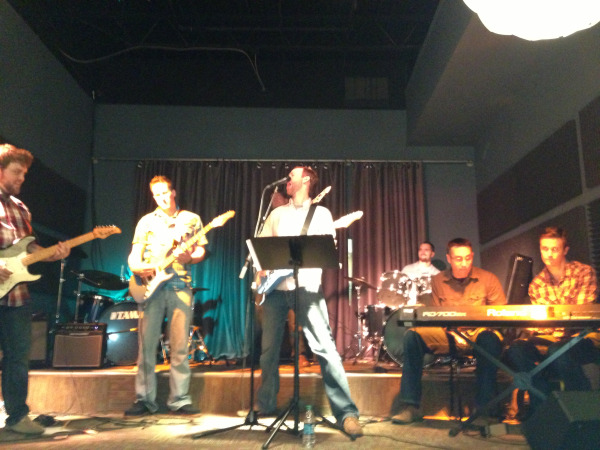 Last Friday night, Creative Soul amped it up with our very first adult event at our S Fort Worth venue! We had our first "For the Grownups" Birthday Party where total beginners to advanced musicians came in, jumped on an instrument, learned a couple of songs from one of our experienced Band Instructors, and by the end of the only 2-hour party, performed on our stage for the rest of the crowd! One of the total beginner guests at the party, Tara Clark, joined the fun in the spontaneously created girl band, "Girls plus John", in one of our band rooms, by trying her luck on the bass! With the help of our Instructor and some simplified beginning instruction, she was learning the bass parts to Joan Jett's "I love Rock N Roll" and jamming out with the rest of the group! "Creative Soul rocks as hard as I did", were her final words as she left the party, smile on her face, feeling accomplished and having a great time connecting with her friends in this innovative party "Band Experience"! Other guests were just as pleased, pushing their "I can't play music" fears aside to try new instruments they had never played before or even trying an Instrument for the first time ever! Even I had a blast singing in our newly formed girl band, the song "I Love Rock N Roll", and trying out the drums for the first time with a "real" band feeling! "For your own Event Rental Space"